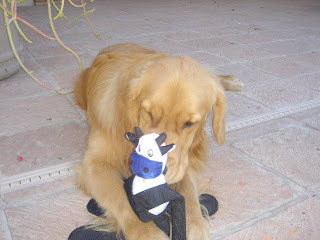 The toys that the dogs like the best always have the shortest life span. 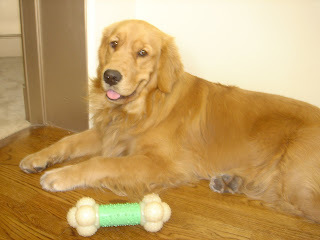 The average life span of my golden retriever puppy's toys is 7 days. We spend so much money right now on dog toys that I am thinking about putting in a separate line item in the family budget labeled "dog toy allowance". It hurts to pick it up much less chew it! 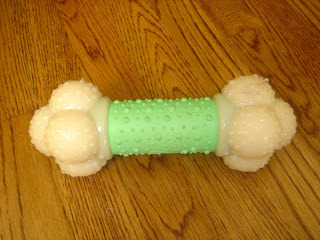 The softer green part is hard for Wrigley's mouth to chew it without getting scratched on the two ends. 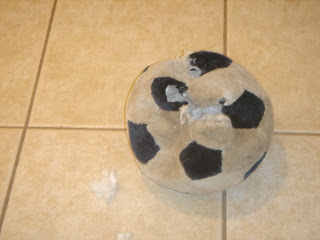 I don't think Wrigley would touch this toy even if I dipped it in juice from a steak! This toy's going to be around for a long time! 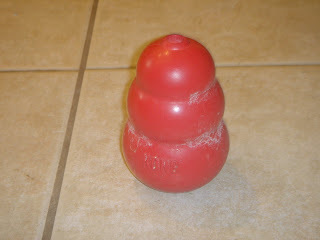 This round toy's been around for a month or two. It's soft but apparently doesn't taste good or is much fun to play with, but he does like to rest his head on it before taking his afternoon nap. 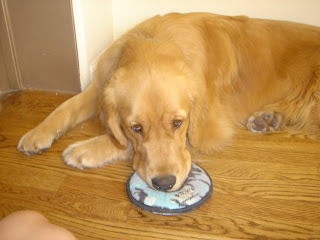 It also works well for collecting dust and dog hair while being scooted on the wood floors! Of course tennis balls are fun if you throw them. 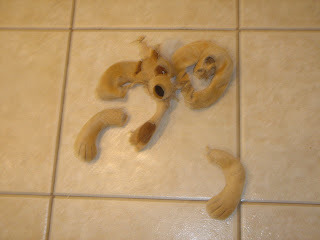 Tomorrow, I will head to my favorite pet store and choose some innocent victims, er, toys for Wrigley to enjoy, er, destroy. Now it's your turn. 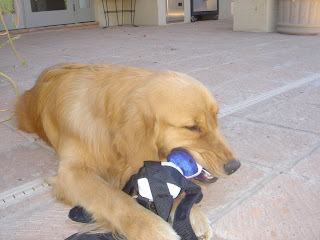 Send me your recommendations of your dog's favorite toys in the comments. Thanks. That is so true. Lexy will kill stuffed animals in about 3 minutes. I did find a soft rubber ball at a store, I am not giving that store credit her, she has played with is for about a month and cant kill it. She has tried but the ball wins!!! I've never had a dog that likes the squeeky toys but Puddles loves them - especially when my husband is watching a serious show on tv. She does it to get attention. First, thanks for the fly-by and salute at my blog. How did you find me? I've perused your blogs and must say I'm impressed that you have so many and they are all active!! Wow! I enjoyed the bits I read of each of them, and want you to know you've created a problem for me .... how will I decided what to read?? LOL! Lucy loves to play with Tennis balls by herself. She throws them up, watches them bounce and then pounces on them. 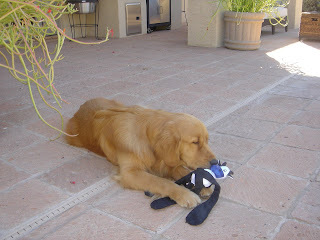 Her "sister" (our other, older dog) is also a great toy for her. She pounces on her too. Tug toys are good, but then you have to be ready to tug. Nylabones last a long time and keep her happy. Oh, and you can always get stuffed toys for cheap at Goodwill. Just make sure to take off any buttons or things the dog can swallow. 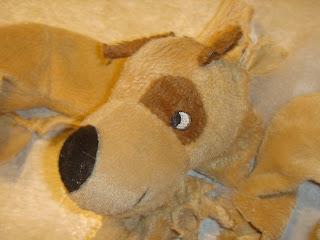 The toy demolition is adorable...I'm sure not for your pocket-book...but definitely makes for a funny blog! The toy demolition is hilariously cute (I'm sure it's not for your pocket-book) but it does make for a funny blog post!